WASHINGTON NAVY YARD – The sailors who were manning the combat nerve center of USS Fitzgerald (DDG-62) did not know they were on a collision course with a ship almost three times their size until about one minute before impact, according to new information revealed in the preliminary hearing for two junior officers accused of negligent homicide for their role in the collision that resulted in the death of seven sailors. Lt. Natalie Combs, the tactical action officer, and Lt. Irian Woodley, the surface warfare coordinator, were both on duty in the windowless combat information in the belly of the guided-missile destroyer on early on the morning of June 17 as the ship moved southwest from the coast of Japan less than a day out of port. “[Based on the interviews] the general consensus was it was a quiet night in CIC with four to five tracks and nothing within 10,000 yards,” said Rear Adm. Brian Fort, the lead investigator into the admiralty investigation following the collision, said at Woodley and Combs Article 32 hearing on Wednesday. Then, shortly after crossing into a busy shipping channel, the merchant ship ACX Crystal popped up on the CIC’s commercial ship automatic identification system dangerously close to Fitzgerald. The container ship was bearing down on the warship, bow pointed toward the middle of the warship. Woodley ordered the camera used to spot targets for the ship’s 5-inch gun toward the bearing of Crystal. Fire Controlman Second Class Ashton Cato, who manned the camera, saw the flared bow of the ship fill up his monitor just seconds before the fatal crash. Prosecutors argued during the Wednesday hearing that the fact that Woodley and Combs did not know the ship was at risk from Crystal, did not see other nearby contacts and were not in contact with the bridge crew was evidence of criminal negligence and hazarding the ship. During the course of the hearing, prosecutors called witnesses to outline that the role of sailors in the CIC was to assist the bridge watch in understanding the surface picture around the ship, to make the point that Woodley and Combs failed to live up to that standard. In combat, the TAO fights the ship, coordinating attacks on air, subsurface and surface threats. But the role is different during a peaceful transit. “The TAO has other areas of focus, but if they aren’t worried about the [air] or subsurface threat, they can truly focus on the surface picture,” retired Capt. Bud Weeks, an instructor at the service’s Surface Warfare Officer School, testified on Wednesday. He said CIC and the team on the bridge needed to be in constant communication to develop a good understanding of what’s happening around the ship. However, that communication was non-existent during the late night watch, Fitzgerald officer of the deck Lt. j.g. Sarah B. Coppock admitted on Tuesday when she pleaded guilty to a single count of dereliction of duty as part of a plea deal in a special court-martial. “Coppock did comment that she had received poor information from [Woodley] before,” Fort said in testimony. However, the ship’s executive officer, Cmdr. Sean Babbitt, admitted to the Coast Guard during its safety investigation that he didn’t completely trust Coppock and that the inclusion of Woodley in the CIC was to provide backup for a bridge watch team he said wasn’t the strongest. Woodley and Coppock had very different pictures of what was happening around the ship, and it would have taken communication to reconcile the differences. 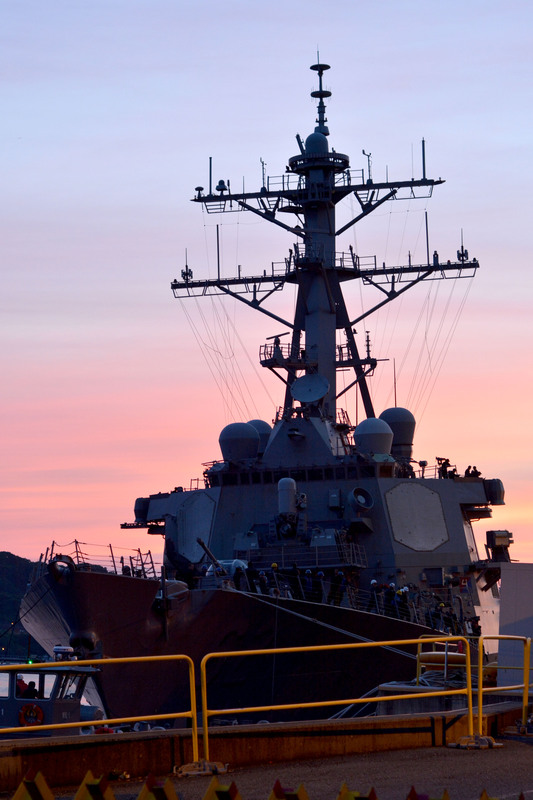 While the bridge had almost 200 contacts on its SPS-73 radar, the CIC’s SPS-67 radar had an only a handful due to an overall “poor radar picture,” Operations Specialist Second Class Matthew H. Stawecki said at the hearing. “There was a lot of clutter,” he said. Part of the reason the picture was muddy was the radar had been set to a long-range so-called “long pulse” mode that made contacts close to the ship difficult to see. The setting couldn’t be directly adjusted from CIC, and Fort’s investigation found there was no effort to contact the ship’s electronics technicians to adjust the radar picture. “They accepted the fact they had clutter, and they didn’t do anything about it,” Fort said. But according to Fitzgerald’s former combat system officer, the circumstances of broken equipment and lapses in crew training were commonplace for a warship that was part of Forward Deployed Naval Force in Japan. Lt. Cmdr. Ritarsha Furqan, who reported to Fitzgerald in 2014 and left the ship a few months before the collision, said deploying with missing crew, insufficient spares or systems that didn’t work, under the direction of U.S. Pacific Command or Pacific Fleet was the norm — even if what was broken or who was missing violated a deployment redline, she said. “[Redline issues] were a much bigger deal with U.S.-based ships. They weren’t showstoppers in 7th Fleet,” she said. The pressure to deploy at a moment’s notice made it difficult for the crew to be proficient in all the tasks they needed to accomplish, and training time was cancelled with no notice for operational tasking, she testified. For example, following a longer-than-anticipated repair period, the ship had planned for two weeks of independent steaming to get the crew used to being back at sea. Instead, they were ordered to participate in an exercise and spent four months underway, moving from task to task at the expense of training time. Along the way, the ship suffered casualties they couldn’t fix, including the loss of both their unclassified and classified NIPR and SIPR networks. During the hearing, the defense and prosecutors largely agreed on the facts of the collision but were split on where to place the blame. Prosecutors said Combs and Woodley shared the blame with executive officer Babbitt and then-ship’s commander Cmdr. Bryce Benson – who faces his own Article 32 hearing on similar charges later this month. Defense attorneys said to look higher. “The Fitz was a wreck. A wreck of a ship,” Combs’ defense attorney, David P. Sheldon, said during his closing arguments of the hearing. The hearing official will now craft a recommendation on how to proceed and provide it to Adm. James Caldwell, director of Naval Reactors. Caldwell is the Consolidated Disposition Authority who was appointed to oversee accountability actions related to the Fitzgerald and USS John S. McCain (DDG-56) collisions. Caldwell, who was not present for the hearings this week, will decide how to proceed with the case later this summer based on the recommendation.